The Hidden Technology for Healing Ancestral Trauma. Our bodies, quite literally, hold the trauma and stress of the past. We know that we can use depth empathy processes, constellations and unconscious contract work to change the way our bodies respond to stress… but did you know that we can also use these processes to actually change the way the generations within us are held? Join me online December 18th, 7 PM PST (recording available if you can’t make it live!) for a free webinar and process work demonstration to experience the wonder of our capacity to hold and begin to heal entire family systems, leading to sustainable brain change, movement and wellbeing. Do you long for more of a sense of connection with past generations? To experience a rooted sense of belonging to people that have come before you, to have a sense of mattering and home? Do you have a sense of bewilderment or sadness at how to move into connection with your ancestors? Or have you experienced unyielding loneliness, depression and anxiety, a sense of being persistently alone and abandoned by the world? Are you longing for resolution of some deep patterns of sadness, guilt, anger or fear, and suspect connecting with your ancestors might be what you need? If any of these are true for you, please consider joining me online for a free process work exploration, to discover new neurobiology-informed depth empathy tools that can support the well-being, groundedness and mattering you’ve longed for by healing rifts in your ancestral line. This webinar is an opportunity to witness and hold space for healing process work, in which I will work with 1-3 volunteers, demonstrating a range of healing tools tailored to what each individual process calls for. There will be a short 10-15 minute explanation and neuroscience introduction at the beginning, then we’ll dive into the processes. How Does Ancestral Healing Work? Recent epigenetic research has revealed that the protein sheath that wraps around each person’s DNA holds the scars of the traumas our families have lived through. Researchers can actually SEE the evidence in our bodies the impact of past-events our ancestors have survived, including genocides, famines, enslavement, natural and human disasters, wars, etc. Further, because our initial cells were already forming in our mother’s womb when she was a prenatal infant inside our grandmother’s womb, we are always living the lives of many generations simultaneously… the foundational cells of our being are inherently transgenerational. Thus our bodies, quite literally, hold the trauma and stress of the past, especially three generations before us. During this webinar, I will demonstrate my process work with 1-3 real people–real seekers–who have agreed to have their process witnessed by others. Together we will trace back the undercurrents of three generations to discover the stories and values that unify families and are passed down through bodies and belief systems. 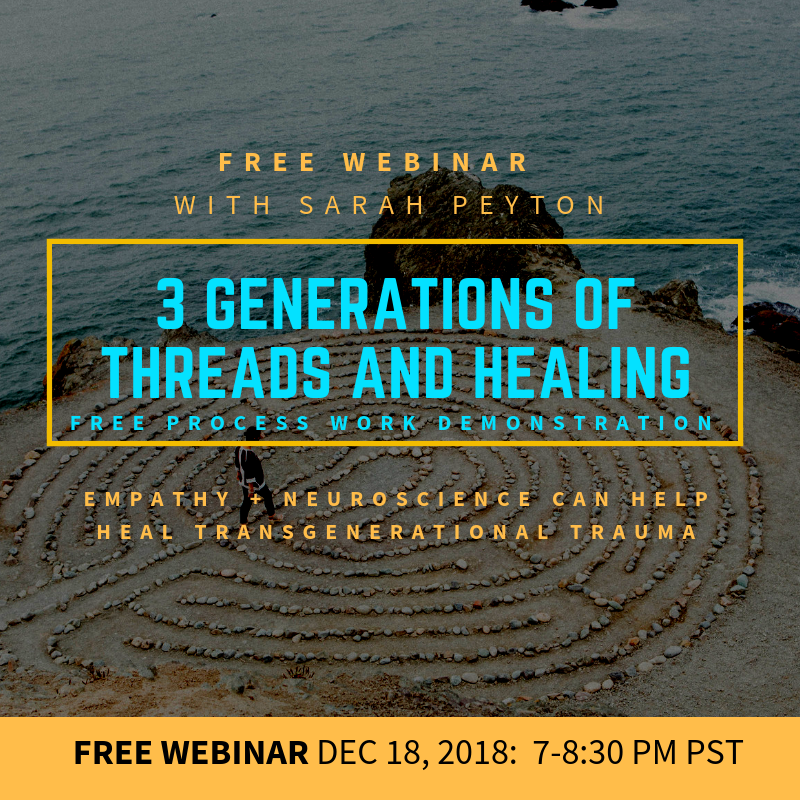 This webinar is an opportunity to be together in exploration and discovery of how to meet and acknowledge the traumas of history and how they impact connection, using my toolbox of resonant language process work (including lightening the implicit load, time-travel empathy, unconscious contract work, family needs guesses and online constellation work). I have worked with Sarah both in workshop settings and one-to-one and have found her presence and support deeply healing, inspiring, reassuring and transformational. 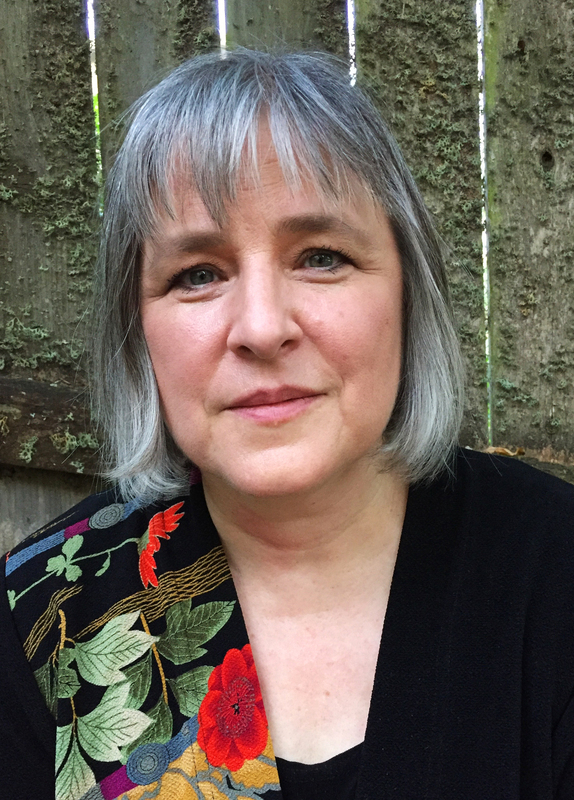 Her gentle empathic style of communicating combined with her wisdom and understanding of inter personal neurobiology has had a great impact on my own healing journey and wider understanding of how to overcome trauma. I can’t recommend her book, retreats, online courses and in-person work enough. I used to struggle with brutal depression… deadening, heavy sadness that made it hard to muster the energy to take a shower or even brush my teeth. Back then, I was in constant battle with a savagely self-critical inner voice that told me I was worthless, stupid, and unlovable. I didn’t realize that my depression made SO much sense given my childhood experiences of family that didn’t provide warm, nourishing relationships, and that part of the healing I needed was to go back in time to be with my ancestors, to heal rifts and past pains that were manifesting in the present. Today, I am an author and neurobiology educator committed to sharing what I’ve learned since then about how to heal past pains and move into a joyful relationship with ourselves. Regardless of your age, genetic predisposition or adverse childhood experiences, your brain is capable of building new neural fibers to help self-regulate your emotions and awaken your body as a place of safety and security. Learn more about the book and download the free meditations here.